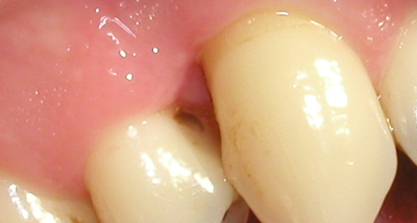 Patient C T had a long history of periodontal disease. She was referred by her dentist to Hygienist, Maggie Jackson as the dentist knew Maggie has worked in specialist dental practices for many years with patients who had periodontal diseases. Over the next seven years, the Patient made regular hygiene visits to Maggie, and had great success using VisionPerio Interdental brushes. Patient C T’s previous oral hygiene routine included regular teeth brushing, with the occasional use of dental floss as she had believed this was helpful in removing food debris. Prior to being treated by Maggie she had not been educated on what she could do to get her periodontal disease under control, and had never used interdental brushes. Some of the brushes had to be very large with a diameter of (size1) 12mm, going down to a 2.5mm (size 6) brush in the different spaces where she had lost bone support for her loosening teeth. With the professional referral, for which she is grateful, Maggie’s advice and treatment, especially the daily use of VisionPerio Interdental brushes the Patients Periodontal disease is currently under control. Recent radiographs showed that whilst the gum pockets had receded to a healthy state however, there had been a previous deterioration of bone which is sometimes possible for a specialist to repair. This led the dentist to refer her on to Dr I D, a specialist periodontist, and a lecturer in periodontology, training other professionals and at a leading UK University. 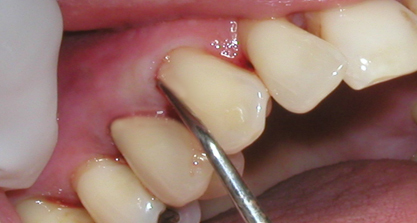 A diagnosis of generalised aggressive Periodontitis that is stable. “Even into the base of the bone crater with 80% bone loss there was a tight, shallow, non-inflamed area. This was quite amazing and something I have not seen before, possibly due to the technique and brand of interdental brushes she uses. Dr I D, Specialist Periodontist and lecturer. If you would like more information on how VisionPerio Interdental brushes can help with Oral Hygiene and Periodontal cases, contact VisionPerio on tel: 0845 634 5000 for our FREE guide. 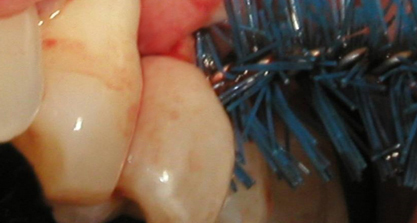 In this case study due to bone loss 12mm brush fits by compressing the papilla. Too small a brush just acts like a toothpick and doesn’t remove the plaque from the root surface effectively. Gingival shrinkage reveals subgingival calculus allowing easier access. Easier maintenance for patient and professional. The curve in the brush allows for a deeper clean. 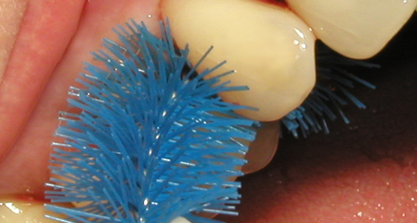 Bristles reach into the pocket achieving subgingival plaque removal. Full range available – sizes from 12mm down to 2.5mm.